Cleaning and protecting your boat is key to maintaining its long-term beauty and value. A few simple boat care tips will keep your boat ship-shape for many years to come. Much like your car, a boat requires regular cleaning and waxing to keep it looking its best. Vinyl seats and covers need a waterproof protectant with strong UV blockers. Metal surfaces must be polished. Eisenglass may need polishing or sealing. With regular attention, all these jobs become relatively quick and easy. A little preventative maintenance goes a long way. This article is part one of our series on Boat Care. A boat sits in water so it doesn’t need washing, right? Wrong. Salt water and fresh water both have organisms living in them that can attach to your boat hull. Before you know it, your white boat has turned green with algae! Regular washing keeps algae at bay. Plus, washing removes corrosive salt from sea-faring boats. Rinse down your boat with fresh water after every voyage and wash it with a boat shampoo periodically. Definitely wash your boat before storing it at the end of season. Meguiars Boat Wash and 3M Heavy Duty Hull and Deck Cleaner are two great boat wash options. A soft Natural Sea Sponge or Sheepskin Wash Mitt will make the job easy. Sometimes algae and those pesky black streaks are just too stubborn for a mild boat shampoo. You need a cleaner that’s made for tough jobs. Meguiars Black Streak Remover is formulated to remove the black streaks that result from organic matter decaying and staining the fiberglass, paint and metal. Duragloss Marine & RV Cleaner with Mildew Buster #541 eliminates mildew and stubborn stains on vinyl, fiberglass, tile, and other non-porous surfaces. Use it topside on the railings, vinyl seats, and fiberglass. Use it below deck on counters and in the lavatory. Amazing Roll-Off is a tried-and-true boat cleaner. It works wonders on black streaks, diesel soot, and mildew. Plus, Amazing Roll-Off leaves a protective finish that causes dirt to just roll off!? 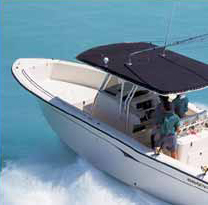 * To prevent black streaks, store your boat in a garage or under a shelter when it’s not in use. Falling leaves, bugs, and bird droppings stain fiberglass. * Treat any mildew stains and allow the boat’s interior to dry out thoroughly before storing the boat in the off-season, particularly if you use a boat cover or tarp. See Step Two: Polishing a Boat. It’s boating season again and 3M has your boat care needs covered with outstanding new products. Make boat maintenance easier so you can spend more time on the water! The following boat cleaners and protectants are available at Autogeek.net just in time to prepare your boat for the summer. 3M Marine Mildew Block – 3M Mildew Block creates an invisible barrier that resists mildew and maintains the fresh, clean look of your boat. 3M Heavy Duty Hull and Deck Cleaner – 3M Heavy Duty Hull and Deck Cleaner makes boat maintenance easy with a built-in sprayer. The powerful fiberglass cleaner removes all the remnants of a day on the water, including algae, fish blood, and waterline stains. 3M Marine Restorer & Wax – If 3M Marine Cleaner & Wax didn’t do the trick, step up to 3M Marine Restorer & Wax. This cleaner wax offers the same one-step performance but it has more cleaning power to remove heavy oxidation. 3M Marine Vinyl Cleaner, Conditioner & Protector – This all-in-one formula cleans and conditions vinyl while adding a layer of durable protection. Use it on interior and exterior vinyl surfaces.